Home / Latest News / The Stampede Takes New Hampshire: Join Us at Democracy Town Halls! Primary season is in full swing in New Hampshire! 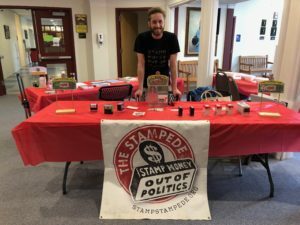 Stamp Stampede was at the heart of the action this Sunday as a co-sponsor at the first Democracy Town Hall in Concord, NH, moderated by Equal Citizens founder and Harvard Law Professor Larry Lessig and featuring 2020 Democratic candidate Andrew Yang. Yang discussed his proposed plan of universal basic income called the “Freedom Dividend,” rank-choice voting for the New Hampshire presidential primary, solutions to gerrymandering, and a voucher system for public campaign financing. Audience members stopped by our table to show support for the Stampede, and when asked if he would fight to stamp big money out of politics Yang was on board! 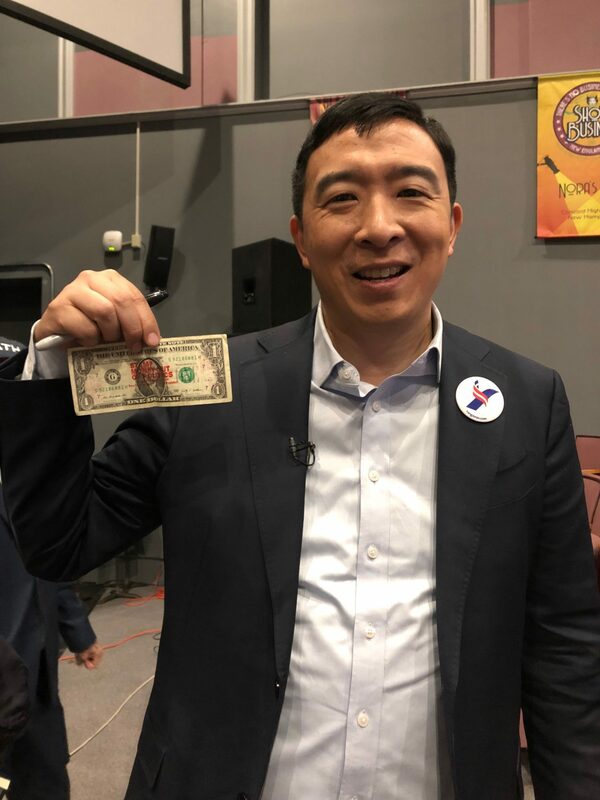 Andrew Yang is pledging to stamp big money out of politics! 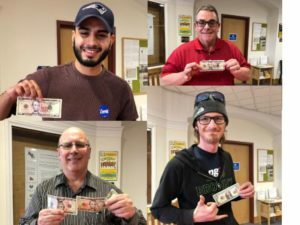 Audience members show off their newly-stamped bills at our table! Remember, stampers: The Key Is To Keep On Stamping!